Finding a mid-size SUV that is attractive and also performs well might seem like a challenge to you. You want to find a vehicle that you will not grow sick of and that you will enjoy driving over and over again. The Ford Edge is a popular choice. Come by West Herr Ford Lincoln of Amherst to learn about the horsepower of the Edge. This vehicle will not leave you longing for more power when you are on the road. You will be confident as you drive this vehicle, knowing that it is made to help you achieve good performance on the road. 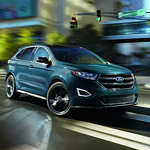 There is a special kind of technology that is part of the Ford Edge that adds to its performance and its efficiency. The Start-Stop technology in this vehicle shuts the engine down when you come to a stop. This helps you save fuel and it allows your vehicle to restart without issue as soon as you let up on the brake.